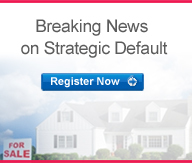 To what extent are home prices really falling again? In Los Angeles, combined sale prices fell 46 percent peak-to-trough and are now 16 percent above the trough, while regular sale prices fell by considerably less, 33 percent, and are now 3 percent above the trough. Distressed sales as a percent of total sales peaked at 52 percent in 2009:Q1, but then fell to a little under 30 percent by 2010:Q2, where it has largely remained (this improvement occurred before the general "robo-signer" process concerns slowed down industry foreclosures). 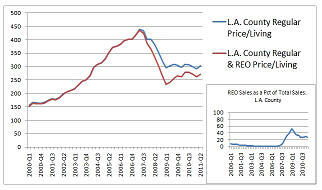 L.A. home prices per square foot have remained largely stable for the past two years, with some increase in distressed-sale prices in 2009. Market prices in this area most recently have tended to remain essentially flat—weak, but not declining anew, with some upward pressure from investors and bargain hunters (previously helped by tax credits before they expired). Double-Dip: No. For more on this topic, and additional examples by city or region, visit the Credit & Housing Market Trends & Technologies blog. Ensure that you receive your copy of this newsletter by adding: eda@e.experian-ems.com to your safelist.